Today (7th April 2016), marks World Health Day, under the theme “Beat Diabetes”, with the aim of scaling up prevention, strengthening care, and enhancing surveillance. Diabetes is among the four leading Non Communicable Diseases (NCDs) that affects morbidity, mortality, and disability in the world. It was the 8th leading cause of global deaths in 2015, and is expected to advance to be the 5th cause by 2030. Importantly, the low-and middle-income countries are more vulnerable to diabetes and related deaths. Sri Lanka too is seeing an increase in the cases of diabetes. 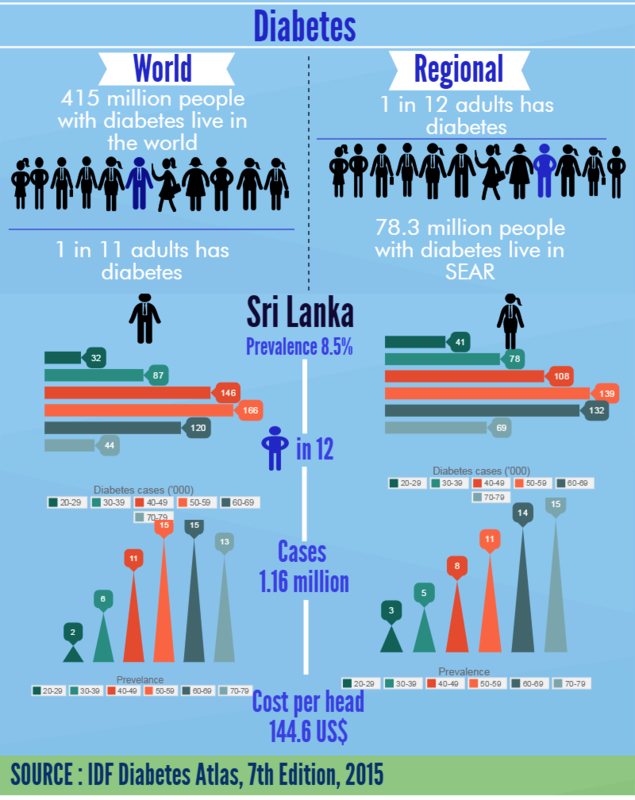 According to recent statistics by the International Diabetes Federation (IDF), (Figure 1), the prevalence of diabetes among adults in Sri Lanka is 8.5%. At present, one in 12 adults in the country suffers from diabetes, which totals to 1.16 million. Over the past five years, approximately 1 – 1.4% of total diabetes patients have lost their lives due to the disease. Diabetes (Figure 2) is a multifactorial disease, which emerges as an irreversible outcome of a combination of metabolic and modifiable risk factors. It is mainly driven by unhealthy diets, insufficient physical activity, obesity, and overweight. With the pace in globalization and urbanization, people’s dietary patterns have changed – both quantitatively and qualitatively. This is phenomenon is called “nutrition transition”. The harmful effects of this transition are aggravated by other lifestyle including sedentary types of entertainment. In this transition, people tend to consume high energy dense food (i.e., food with minimal water content, and rich in saturated fats, trans-fats, free sugar or salt), instead of low energy dense food (i.e., food rich in water, and fiber content, and little fat). Sugar is an important contributing factor to diabetes. While it is an essential ingredient for energy, its excessive intake has negative effects. To prevent and control negative health effects of sugar among adults and children, WHO recommends reducing daily sugar intake to less than 10% of total energy intake (optional recommendation is to reduce below 5%). For Sri Lanka, the recommended sugar consumption is about 25 grams/6 teaspoons of sugar per non-diabetic person per day. However, an average Sri Lankan consumes 36 grams of sugar a day. In fact, when a person consumes food from outside, this amount can more than double. In order to lead a healthy life, it is important to choose a low-energy dense diet – fruits, vegetables, grains, lean meats (skinless meats), low-fat dairy products, and whole grain foods. While reducing free sugars intake, it is also recommended to at least consume five servings of fruits and vegetables a day. In addition, socio- economic status (e.g., aging, education, income, working environment, living conditions, social life, etc.) and heredity factors are also positively associated with diabetes prevalence. Amongst these, advertisements on food promotion inducing demand for unhealthy food products such as processed / fast foods can play a major role, in affecting healthy food habits, particularly among kids. As such, advertisements can be seen as a driving factor for creating an obesogenic environment that promotes unhealthy food choices and minimizes opportunities for physical activities. Relative to non-diabetic counterparts, those who suffer from diabetes are more likely to suffer stroke, myocardial infarction, or heart failure, kidney failure and lower-limb amputation, eye disease (retinopathy) nerve damage (neuropathy), and oral issues. In addition, mothers with diabetes during pregnancy have a higher chance of developing many complications for both mother and baby. Studies find that a fetal exposed to metabolic abnormalities (high blood glucose) in the womb carries the same risks of developing type 2 diabetes later in life. 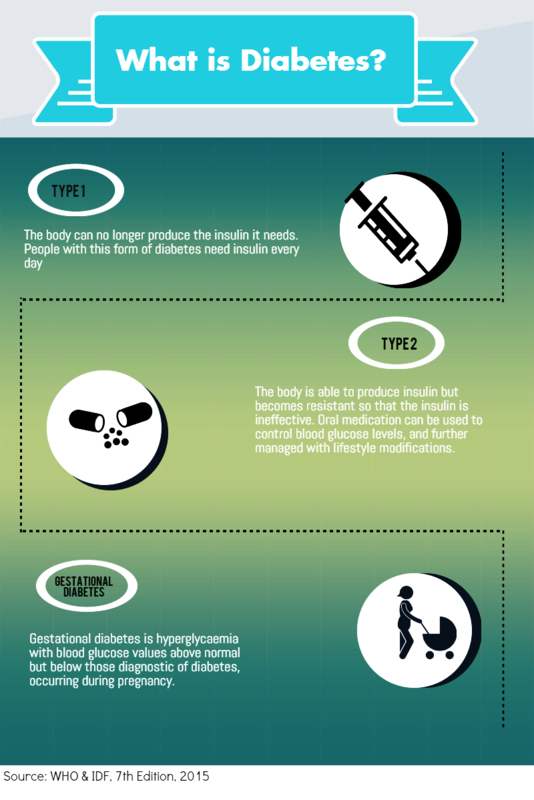 Controlling diabetes requires medication throughout life, and even nursing care for disabled people. Accordingly, a high financial burden is placed on individuals/families, leading to increase out of pocket expenditure. Further, an excess burden falls on the national health systems, and this leads to loss of productivity and substantial burden on the economy. Therefore, prevention — early intervention to control blood glucose levels and other risk factors – has higher chance of reducing the prevalence and mitigating the severity of these conditions. Prevention and control are two means to address diabetes. As per the globally agreed targets towards halting the rise of diabetes and obesity by 2025, increasing access to affordable treatment, including insulin for those living with diabetes is crucial. It is important to note that in Sri Lanka, the Ministry of Health prepared the national policy for NCDs prevention and control about five years ago, and it is currently being implemented. In addition, the Ministry is carrying out essential interventions in line with the action plan introduced by the WHO-SEARO for NCDs prevention and control. For instance, these include introducing 8 risks factors through ‘Super 8’ concept, establishment of Healthy Lifestyle Centers (HLCs) at primary health care institution for screening people, introduction for Package of Essential NCD interventions (PEN) for primary health care. Diabetes can also be prevented by implementing lifestyle modifications including maintaining an age-appropriate body weight, engaging in physical activity, and consuming a nutritious diet. However, creating public awareness about healthy lifestyles such as through the ‘Super 8’ concept is futile if the government does not provide prerequisites for such changes (e.g., adequate spaces for exercise and ban on unhealthy food products). Health experts recommend people should opt for natural, high fiber, and less sugar food. The main issue here is the lack of availability, accessibility, and affordability of such food in the market. For instance, only a very few places sell rice/whole grain flour based products, and these outlets are limited to urban areas. Even though Sri Lanka has sufficient resources and technical knowledge in introducing convenient and nutritious healthy food stuffs, government support (e.g., trade and fiscal facilitation) including political interest needs to be further enhanced. In 2015, the government made a decision to display different colour labels for beverages, with a red label to denote high sugar content, but it is yet to be implemented. However, a proposal to hotels/tea shops to serve sugar with tea/coffee in a separate container has seen the light of day. Further, medical experts have appealed to different food companies to align their advertising with the national goals, and to be ethical in their messages when targeting children. However, this has so far not seen a positive response. Finally, we as consumers have a major role to play in the prevention and control of diabetes. Leading a healthy life style is one way to beat diabetes. You can try simply by maintaining your weight, engaging in regular physical activity, and having an ‘eat-well plate”. You can start making this change at your home, as a step towards beating diabetes. De Silva A. (2012), Marketing obesity and chronic disease; unethical food advertising and the role of nutrition professionals, Nutrition Focus -The Official newsletter of NSSL, Issue 01- 2012, Nutrition Society of Sri Lanka, Department of Applied Nutrition, Wayamba University of Sri Lanka. 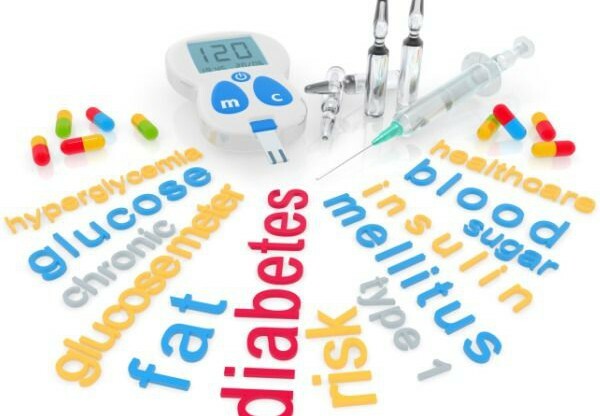 Treating type 1 diabetes and some cases of type 2 diabetes has long required painful and frequent insulin injections or a mechanical insulin pump for insulin infusion. But researchers from the University of North Carolina and NC State have now developed what could be a much more patient-friendly option: artificial cells that automatically release insulin into the bloodstream when glucose levels rise.